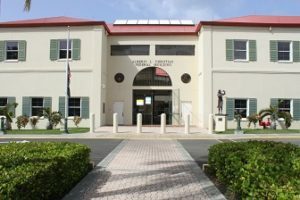 Ron Delano Kuntz, 44, of St. Thomas, and Shawn McIntosh, 25, and Keon Wilson, 23, of St. Croix, were sentenced Thursday for their roles in the armed robbery of the Gems and Gold Corner jewelry store, located on the St. Thomas waterfront, U.S. Attorney Gretchen C.F. Shappert announced. A co-defendant was sentenced a week earlier. District Court Judge Curtis V. Gomez sentenced Kuntz to 78 months in prison for conspiracy to commit Hobbs Act robbery, and 78 months for Hobbs Act robbery, both sentences to run concurrently, with a consecutive sentence of 84 months imprisonment for brandishing a firearm during a crime of violence: a total term of imprisonment of 162 months. He sentenced McIntosh to 67 months in prison for conspiracy to commit Hobbs Act robbery and 67 months for Hobbs Act robbery, both sentences to run concurrently, with a consecutive sentence of 84 months imprisonment for brandishing a firearm during a crime of violence: a total term of imprisonment of 151 months. He sentenced Wilson to 51 months in prison for conspiracy to commit Hobbs Act robbery and 51 months for Hobbs Act robbery, both sentences to run concurrently, with a consecutive sentence of 84 months imprisonment for brandishing a firearm during a crime of violence: a total term of imprisonment of 135 months. Gomez also sentenced each defendant to three years of supervised release on counts one and two of the indictment and five years on count three. Judge Gomez ordered each defendant to pay a $300 special assessment, and perform 400 hours of community service. After a two-day trial in January, a federal jury convicted Kuntz, McIntosh and Wilson of conspiring to commit and committing a Hobbs Act robbery of Gems and Gold Corner Jewelry Store on St. Thomas, on Sept. 16, 2013. According to the trial evidence, these individuals and others conspired to rob the store and brandish weapons to threaten and intimidate store employees, and four of the individuals fled the store with merchandise. Prior to trial, four defendants entered guilty pleas. Earlier this month, Jarmaine Ayala pleaded guilty to conspiracy to commit Hobbs Act robbery and on July 11 Gomez sentenced Ayala, age 37, to 67 months in prison, three years of supervised release, and a $100 special assessment. Gomez also ordered Ayala to perform 400 hours of community service. Kuntz, McIntosh, Wilson and Ayala were ordered to pay restitution in the amount of $31,027.81 to Gems and Gold Corner and $130,322.12 to Dorchester Insurance.